Just as there could have been no Tanya Tucker without a Dolly Parton I believe the current wave of female upstarts, like this year’s Best Country Album Grammy-winner Kacey Musgraves, owe a debt of tanks to Miranda Lambert. Lambert is the only contemporary country music artists to be featured on the bible of alt.country No Depression, Lambert often chooses to cover songs by greats like Gillian Welch, Fred Eaglesmith. An she often channels the greats – Haggard, Loretta – in her own songs. And when her songs hew a little too close to an an influence, like when it was brought to her attention that her her hit song “Kerosene” closely resembled her hero Steve Earle’s 1996 comeback single “I Feel Alright” she retroactively gave Steve Earle writing credit for the song, owning up to a simple case of unintentional plagiarism. As they say imitation is the sincerest form of flattery, just as long as you pay up. Right Dierks Bentley? Lambert’s newest song she wrote with Nicolle Galyon, a contestant from second season of The Voice. and Natalie Hemby who has written for Lee Ann Womack, Eli Young Band and many others. The mid-tempo cut has Miranda lamenting about the good old days. This might seems strange corning from a 30 year-old but “Ran” pulls it off by trading in a country music standard trope of nostalgia without cloying sentimentality. Lambert drew on her personal experiences to co-write “Automatic,” which details early memories like using pay phones, recording country countdowns on cassettes and driving to Dallas to buy an Easter dress. She wrote the song with Nicolle Galyon and Natalie Hemby. The song’s topic also ethos a current wave in America to move back to a small, craft-based culture and economy. I enjoyed listening to it over and over while enjoying a locally brewed beer. “Automatic,” is a track from a new as-yet untitled album expected later this year. I totally agree. 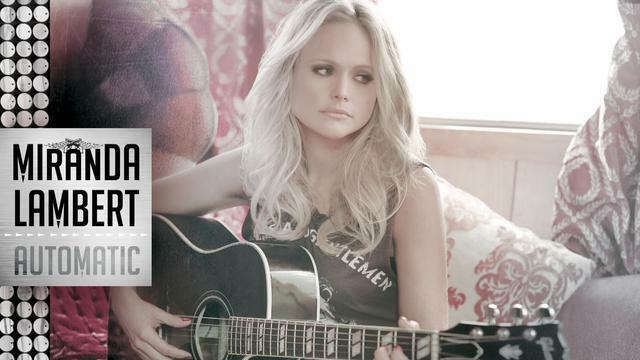 If Miranda’s CDs didn’t sell there would be no Pistol Annies. If the Annies older style sounding CD didn’t sell no way would Musgraves, Monroe, Clark, etc. would have been given an opportunity to write their own music and release a CD. Country is better for all the above music.:). Really like Automatic. This is how Miranda lives her life when off the road. She lives a slower life in a 3000 person town. Also a great message inside a catchy hook. Can’t wait for her new album.